Slow cookers are a perfect answer to a busy schedule. Whether returning from work or from kid’s activities, if you have your meal set in a slow cooker then you have one less thing to worry about. Before leaving for work, do a small amount of work in the morning and you come home to a meal that is half cooked – all that is left is some final touch ups, cook some chapatis and you are all set. Dinner ready in 30 minutes – now that’s exciting and comforting!! Today’s recipe is tested and tried many times in my kitchen and every time it’s a winner. Meals prepared in slow cooker are very healthy as it uses very little oil or no oil at all (besides the tadka/tempering). Also, slow-cooking is a very gentle method and helps in retaining the nutrients of veggies as compared to other cooking methods. RECIPE DETAIL – I have used frozen spinach for this recipe but feel free to use fresh spinach leaves (500 gms of fresh spinach leaves). Add everything to the slow cooker, close the lid, set the timer and you are all set in 5 hours. After the specified cooking time, prepare the tadka/tempering. I like to add some besan (gram flour) to the tadka and cook until besan is light brown in color. Besan adds a rich texture and tends to absorb water and thicken the spinach. Finish the recipe by adding cooked paneer pieces and adjust seasonings. Serve hot with warm kulchas. Another way to cook and retain a beautiful color of spinach would be to add onion, tomatoes, ginger and garlic along with salt and water to the slow cooker. Set the timer for 4 hours. After the mentioned cooking time, mix in blanched spinach, all the spices and cook for 40 minutes on HIGH. Once the cooking time is over, puree the spinach, adjust seasonings, add tadka and enjoy!! Looking for palak paneer cooked over the flame – click here. Also try other slow cooker recipes – slow cooker ghee, slow cooker langarwali dal, slow cooker kadhi, slow cooker Punjabi lobia. 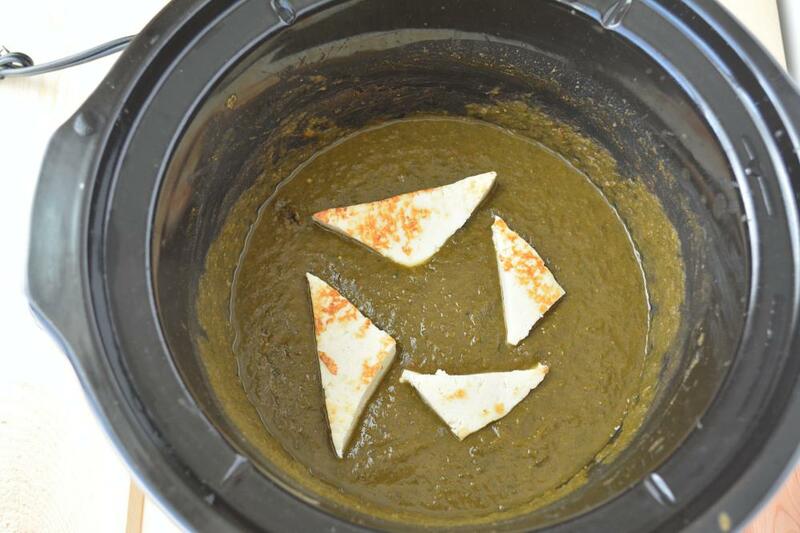 Amazingly delicious palak paneer cooked in slow cooker. Rich, creamy and absolutely D-licious meal!! In a slow cooker add palak. Add chopped tomato and tomato puree. Add salt and turmeric powder and..
Close the lid and set the timer on HIGH setting for 5 hours. Meanwhile cut paneer in cubes or triangles. Heat and grease a tawa or griddle. Place paneer pieces on the hot griddle and cook until evenly brown from all the sides. Remove from heat and set it aside. Grind spinach/palak to a fine paste. Add coriander powder, garam masala powder and mix. Cover and let it simmer. Meanwhile assemble ingredients for tadka. Heat ghee/oil in a pan, add cumin seeds and besan. Cook until besan turns light brown in color. Pour tadka/tempering over palak/spinach and mix it well. Adjust seasonings and mix in paneer pieces. Cover and let it simmer for another 30 minutes. After 30 minutes, unplug it and feel free to add some cream and serve hot with warm rotis. My slow cooker is not programmable. Then how to adjust the timing for a particular dish. Because I am really inspired by your cooking and want to use slow cooker. Thanks in advance. If its not programmable than you have to use a manual timer to slow cook your recipes. Hi! I find that I never know how much salt to use so how much would you recommend? For this recipe, I suggest you add 1 teaspoon of salt and adjust according to taste. Just made this and it is delicious – this is my now go to Palak Paneer recipe. This was delicious. Ate it with garlic naan. The only change I made was to use plain all purpose flour (maida) instead of besan, because that’s all I had. I was a bit worried the spinach mixture would burn because my 6 quart crockpot was just about 1/4 full, but it was completely fine. I stirred it once and added 15 minutes to the cook time, just to be safe. Bookmarked and will make often. Please make more slow cooker Indian recipes. All the ones I’ve tried before this have been bad, so you seem to know what you’re doing haha. Thanks! Hey Ruchi, me again! I’m planning on trying to cook this and freeze for later use. How do you suggest I go about doing this? I won’t add the paneer before freezing, but should I add the tadka? Also how do I reheat the frozen dish in the crockpot? How long do you think it would take to warm back up in the crockpot? Once it warms up I can add the paneer, right? Any suggestions/cook times would help. Thanks! Anisha, prepare palak,do the tadka then freeze. You can reheat cooked palak over a cooktop or in a microwave. To warm frozen palak in a slow cooker – I would suggest thaw the cooked palak in your refrigerator overnight then transfer it to a pre-heated slow-cooker and warm for 30 minutes. Add paneer and enjoy!! Thank you for the recipe, it was very delicious. I am interested in making it spicier. How can I change the recipe to make it extra super-duper spicy? Thanks for trying the recipe Ray. I am glad you liked it. To make it extra spicy you can add chopped green chilies while cooking spinach. Other way would be to adjust the quantity of red chili powder from 1 teaspoon to 1.5 teaspoon or even more. Depends on how much spice you can handle. Wont green leafy vegetables like palak lose all its nutritional value if cooked in slow cooker for 5 long hours??? Thanks for stopping by Dr. Chakshu! I do agree that tender vegetables like spinach loose some of their nutrients while being cooked in the slow cooker but all the nutrients lost is compensated by using the liquid in which spinach was cooked. All that slow cooking adds a nice flavor to the dish. This is an alternate method for busy and working families who can come home to a warm and fresh dinner waiting to be eaten. Thanks Huma! I have just published a no onion no garlic Palak Paneer recipe. Check that out, please! Perfect recipe. I think I hit a jackpot. Perfect blend of spices and restaurant style palak paneer. I added cream in the last and my Indian hubby was very happy. Surprisingly my color was much greener than yours, maybe it’s the palak that we get in singapore is much green. Overall a happy visitor and this was my success story. Thanks for the awesome recipe, I tried it and taste so good. Amazing Recipe. Tried it and it turned out really nice. Everyone loved it. Can’t believe how good it taste with such little effort. Looking forward to try more slow cooker recipes. Hi Ruchi, never tried this way of tadka- giving tadka to besan and then pouring besan in palak. I mix besan directly in palak and then give tadka to palak. Will try this way too. Hey in restaurants i get a strong flavor of garlic or ginger, but not able to simulate that flavor. Any thoughts? Thanks for stopping by Deepshikha!! After you have cooked palak, give it a final tempering/tadka of ghee, finely chopped garlic and thinly sliced ginger. 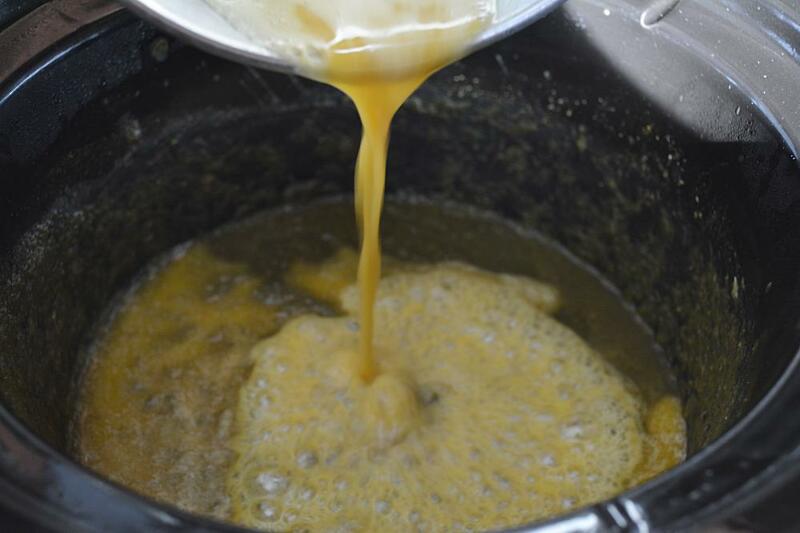 Cook until garlic is light brown in color, pour over palak paneer. Simmer it for a minute and enjoy!! Following you from Facebook. I admire your cooking and your pictures. Made this last night and everyone loved it. My mother in law was impressed with saag paneer. She liked the rich deep flavor. Loved it and will be making it again and again, only one thing can the saag green color be retained in slow cooker? But that’s the last thing I would worry about. Just curious. Hello Ruchi, just a heads up, I tried this in slow cooker and it came out really nice. I had used fresh spinach and my palak paneer had some water after cooking time. I decided to leave the lid open for some time and the issue was solved. Next time will add less water. Secondly, I added besan in the start and it was cooked along with palak paneer. Thanks so much, slow cookers are really a blessing. Tried this recipe and it was a hit. The flavors were so much infused and blended. Taste much much better than what I cook. From now on always makin palak paneer in crockpot. Looking for more.